Now available year-round in six-packs, Fresh Squeezed IPA is brewed with Pale, Crystal and Munich malts and hopped with Citra, Mosaic and Nugget hops. Beer for breakfast? Yes, please. 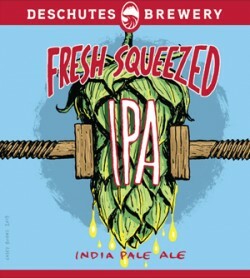 Especially when it’s Deschutes’ Fresh Squeezed IPA. It starts off with a gorgeous, glowing amber body and a rich, ecru head, then juicy aromas greet the nose. Mouthwatering fruity, juicy—not pithy—touches of grapefruit, orange, tangerine, tropical fruits, lemon and lime settle onto both the nose and the palate. While the initial flavors are sweet and fruity, a good dose of hop bitterness (there’s that citrus-peel bite) comes through near the end, keeping it all in perfect harmony. This is an essentially drinkable IPA, and this reviewer is thrilled Deschutes not only brought it back this year but will also brew it year-round. Pale copper in color and lightly frisky in carbonation, this beer looks very nice in the glass. The hop aroma is gentle, fruity and minty, and although the hops are American, the overall impression is almost British. Sweet malts open up in the center, giving the beer plenty of body before it moves toward a dry finish. The hopping here is very much in balance with all the other elements, and the result is tasty. A hop bomb it isn’t, but that isn’t always what you want. This is going to do a much better job with that burger you’re thinking about.